The writer of "Miscegenation" considers it a most providential event, and as one significant of the type-man or miscegens of the future, that the statue on the dome of the Capitol at Washington is of a "bronze tint." But it is possible that he mistakes its significance. As has been shown in these pages, the mixed or mongrel people perish, and are blotted from the face of the earth. The Egyptians, the Carthagenians, and now the Mexicans, are historical examples of God's punishment upon those who dare to mar the works of His creation. The dome of the Capitol, therefore, with its mulatto statue, has the symbol of decay upon it, and it would seem to constantly point to the triumph of the Confederate or White Constitution in the place of the mongrelized one which the folly of the hour has deified. John H. Van Evrie, Subgenation: The Theory of the Normal Relation of the Races; an Answer to "Miscegenation," (New York: John Bradburn Publishing, 1864): 67. Read the entire article here in HTML or PDF. Beautifully written and illustrated by Faith Ringgold, this children’s book accompanies the major exhibition Henry Ossawa Tanner: Modern Spirit. 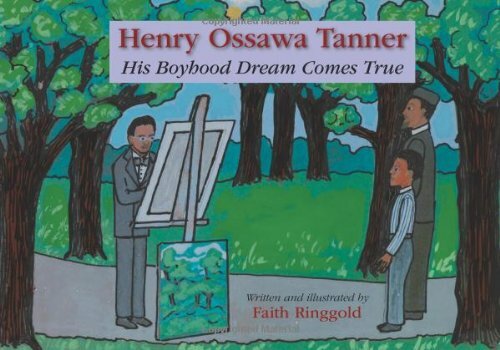 Faith Ringgold’s depiction of Tanner’s struggle to achieve his dream and his success as a painter on the world stage will inspire and challenge young readers to look at the artist’s work and maybe go out and buy a few brushes and dry pigments (like Tanner did as a young boy in Philadelphia just 3 years after the Civil War) and set out to achieve their own dreams. This article examines the filmic representations of the mulatta body in the films Sparkle (1976), Flashdance (1983) and Honey (2003). More specifically, this article seeks to unravel how the Hollywood filmic apparatus engages with signifiers of raced sexuality and hierarchies of dance styles to enforce and reify mythic narratives about dance, dancing raced bodies and dance-making. By establishing a genealogy of the mulatta body in a US context through dance and/or performance films, these juxtapositions illustrate how the mulatta subject develops from a tragic figure (in Sparkle) to an independent and self-reliant one (in Honey). Critical dance studies provide the analytical framework by allowing a focus on particular choreographed and improvised dance sequences performed by each film’s respective mulatta protagonist. of sixteenth century Spanish origin, documented in English since 1595, and designating a child of a black and a white parent, was long considered etymologically derived from ‘mule’; yet it may also come from the Arabic word muwallad (meaning “Mestizo” or mixed) (1999:128). Even with skin that approximates ‘whiteness,’ the proverbial ‘taint’ or ‘drop’ of impure African blood condemns her and her value to be less than human, despite the fascination with her representation of ambiguity and varying skin colour gradations. The undervalued ‘figment of [the concept of] pigment’(1998:16) as DeVere Brody calls it, conversely added to her value as a popular sexual commodity for heterosexual male desire. As a filmic presence, the mulatta first appeared in D.W. Griffith’s Birth of a Nation (1915). Lydia, the mulatta mistress of the white abolitionist carpetbagger, appears independent, powerful, threatening, yet desirable. Film historian Donald Bogle attributes this connection between ‘the light-skinned Negress’ (2001:15) and desirability to a closer proximity to a white aesthetic ideal which gave ‘cinnamon-colored gals’ (2001:15) a chance at lead parts. Other films such as Imitation of Life (1934; 1959), Pinky (1949), Shadows (1959), and Devil in a Blue Dress (1995) utilize the trope of the mulatta and render her full of regret, emotionally unfulfilled, or sad and alone due to each film’s respective circumstances. As Charles Scruggs states, ‘the mulatta is a visible expression of the broken taboo, a figure bearing witness to the interconnection of the races, and the “site of the hybridity of histories”’ (2004:327). Fraught between desire, melancholy, and despair, the mulatta usually encounters a tragic fate, unable to escape these pre-scripted choreographies of her race. These characterizations prevent more complex representations of this racialised and gendered body primarily by constricting the notion of mulatta into narratives based on textual discursive practices. As a result, the mulatta figure suffers from rather limited representations unable to acknowledge her potentiality as something other than tragic. In this article, I seek to vivify and corpo-realize mulatta representations by particularly focusing on films where mulattas use their bodies, specifically their hips in active mobilizations as performers, dancers, or choreographers. As I have argued elsewhere, my theory of hip(g)nosis exposes the contours of the hip as a site of cultural production, produced and deployed by historically racialized mulatta bodies in their negotiation of ‘blackness,’ ‘whiteness,’ the political economy of pleasure, and becoming. As a result, the excesses of the hip’s choreography, its existence as a product that can dazzle, dodge, divert and, of course, hip-notize locates it as/in a space where the enacting mulatta body achieves some agency through the different values imposed on it. Thomas Jefferson was a private man who kept his personal life to himself, and yet today 18,000 of his letters exist in the public forum. In them, this farmer, architect, inventor, philosopher, politician, attorney, and “man of letters”—learned in all disciplines, a true visionary—expounded upon everything but his love life. This we know of Jefferson: he was a deist, a moralist, and a revolutionary. He wrote the Declaration of Independence and, in a letter to James Madison from Paris, suggested adding a Bill of Rights to the U.S. Constitution. He held positions of prominence within the newly formed United States (secretary of state, vice president, and president). He also wrote the book, Notes on the State of Virginia, and edited the New Testament into a volume he considered more believable, leaving out all the miracles and keeping what he considered the moral teachings of Jesus. He was proudest of founding the University of Virginia. And like all of the Founding Fathers, he’s become an icon, above the hoi polloi. But historians have had to connect the dots to give us a real picture of Jefferson the man—one who has become the model, not only of our intellectual and democratic ideals, but, inadvertently, of the often subtle racism that exists today. In 1810, he listed his daily schedule in a letter to Thaddeus Kosciusko, the engineer from Poland responsible for the Colonies’ fortifications, “My mornings are devoted to correspondence, from breakfast to dinner I am in my shops, my garden, or on horseback among my farms. From dinner to dark I give to society and recreation with my neighbors and friends, and from candlelight to early bedtime, I read.” He got a bit closer to confiding more personal information to Dr. Vine Utley, of Lyme, Connecticut. In 1819 he wrote: “I have lived temperately, eating little animal food, and that not as an ailment but as a condiment for the vegetables which constitute my principal diet.” But despite this sharing of his personal life, he never wrote of the two women who were closest to him during his life—his wife and his slave mistress. …Jefferson’s daughter, Patsy, had already been in Paris with him, and he now sent for his daughter Polly, asking that she be accompanied by a woman servant. Instead, one of the Hemings children, fourteen-year-old Sally, was sent. We don’t know when Jefferson and Sally became intimate, but we do know that she was pregnant when they returned to Monticello. Before a 1998 DNA analysis showed a match between the Jefferson male line and a Hemings descendant, scholars, historians, and the public denied that a romantic relationship between Jefferson and his slave could have happened. As Joseph Ellis notes in American Sphinx: The Character of Thomas Jefferson (1998), Jefferson had become not only an icon but a myth, larger than life. This thinking temporarily blinded people to reality. Today, however, we can look to other events and speculate how his relationship with Sally Hemings may have played a role. His beloved daughter, Patsy, for example, married just two months after returning home from Paris. There is no indication that she and her husband-to-be, Thomas Mann Randolph Jr., had been eager correspondents while she was away, and there is no indication that they had been anything more than friendly cousins before she went to France. Could she have been afraid of losing her number-one spot with her father? Or can we attribute her actions to shock and anger upon learning of her father’s affair with a slave she’d known her entire life? Such a reaction certainly would have echoed the hypocritical and confusing feelings the majority of Americans held about slavery during those colonial and post-revolutionary years. Abigail Adams, for example, was a devout abolitionist but, after seeing Othello, wrote that she was quite undone seeing a play about a marriage between a black man and a white woman. She felt horror and disgust every time she saw the Moor touch the gentle Desdemona. Abigail was no different than most of her peers. When she referred to Hemings as “the girl” rather than using her name, it was hardly seen as strange. …Today, when African-American representatives of the government are spit upon and verbally assaulted, or when more subtle or more blatant acts erupt, the legacy of the past cannot be dismissed, and our most revered historical figures must bear some blame. We could say that Jefferson and the others reflected the social and economic mores of the times, and in a way that’s true. But their thinking had serious limitations and lasting implications. We see this thinking now, not in blatant violence like the lynching of black people or the violent reactions of some whites during the Civil Rights movement of the 1960s, but in less easily discernible ways, like the slow pace we took in eliminating “separate but equal,” in getting rid of poll taxes, or integrating neighborhoods. Today blacks are still paid less than whites in many instances. Discrimination in housing, schooling, and voting still takes place. As a society, we routinely deplore racial violence and say we are not prejudiced, but racism still exists. For instance, U.S. presidential candidates routinely speak at universities, schools, and public venues that discriminate against African Americans. Also, too often religion and bigotry go hand in hand. And when the main objective of a political party is to “make Barack Obama a one-term president,” few people protest, even those who support him. So if we’re being honest, we must contend that otherwise admirable historical figures like Jefferson, Madison, Washington, Monroe, and Abigail Adams contributed to the legacy of racism. Historian Emily Clark has been here before, plowing through New Orleans archival documents from the early 1800s, handwritten in French. Her latest search has unveiled truths about a group of women that Clark says history has maligned: free women of color. “I want to bring them to the attention of history again,” says Clark, an associate professor who holds the Clement Chambers Benenson Professorship in American Colonial History at Tulane. Funding from a state Awards to Louisiana Artists and Scholars (ATLAS) grant has allowed Clark to extend a sabbatical and work on a new book, The Strange History of the American Quadroon. Myths abound about “quadroon balls” in early-19th-century New Orleans in which quadroons—described by Clark as “a name for any woman who seemed to be of mixed race”—were presented to groups of white men. With marriages between the two groups forbidden, what supposedly resulted was plaçage, a contractual living-together arrangement.